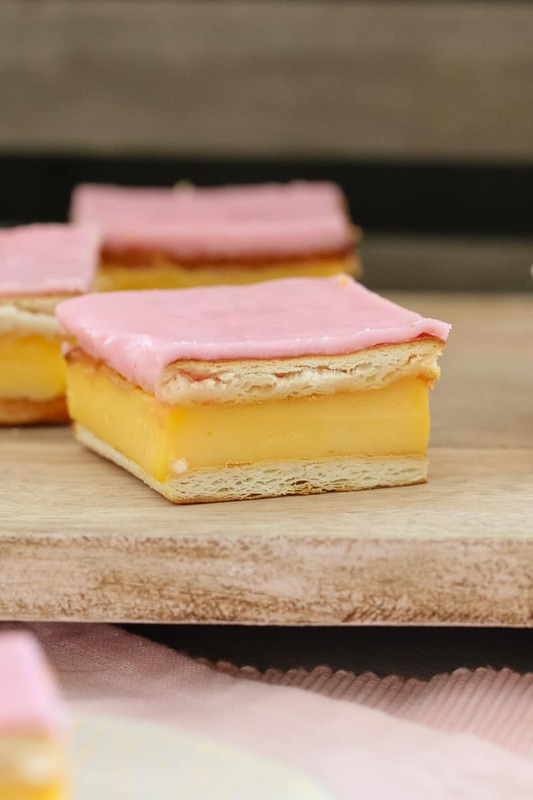 An easy vanilla custard slice recipe made with a biscuit base and topped with a classic pink icing! This is just like a bakery-bought vanilla slice! Do not even get me started on how much I love this slice!!! 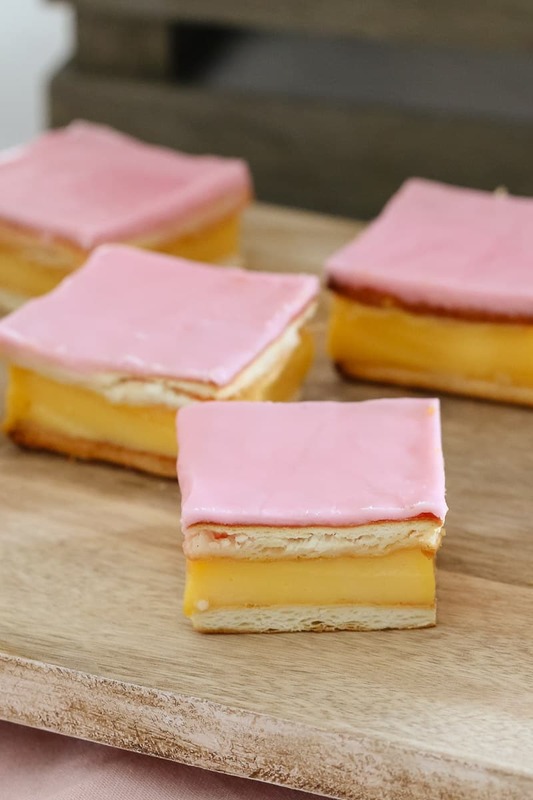 I swear it was one of my bakery favourites as a kid… and I’ve turned into even more of a vanilla custard slice addict as an adult. It. Is. So. Good!! 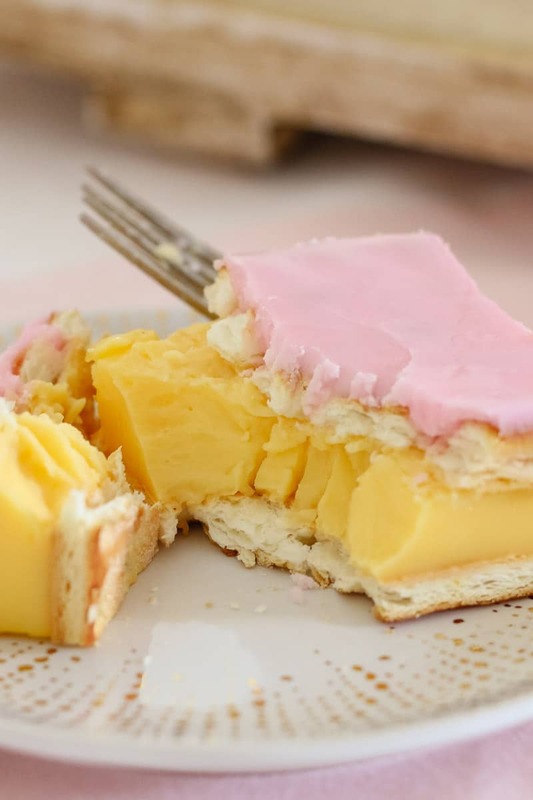 And what makes this vanilla custard slice recipe so good? The simple biscuit base… sure. The creamy custard filling… yep. BUT! The number 1 thing is the pink icing. Trust me on this one. The pink icing is a MUST!! 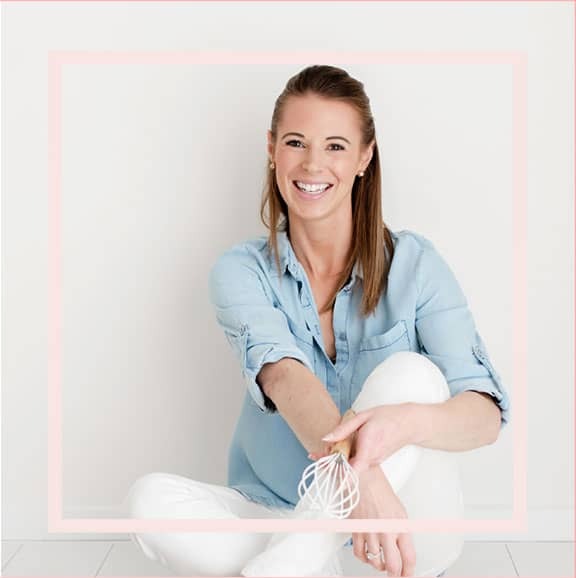 I know lots of people say that a passionfruit icing is the way to go, but I’m a pink icing gal ALL the way! For this recipe I used Arnotts Lattice biscuits (you could also use Sao biscuits – or any square sweet biscuit). If you use a square cake tin, you’ll fit 9 of the Lattice biscuits perfectly on the base. How easy is that!! The trick for getting the filling just right is to cook the custard until it’s really nice and thick. This way it will set beautifully and you’ll end up with a slice that tastes amazing… and is easy to cut into pieces! Speaking of cutting this slice, as you can see in the pictures the icing is quite thin. This is so that you can still faintly see the outline of the top layer of biscuits when you go to cut the slice into squares. It’s like the perfect little guide. And there you have it! 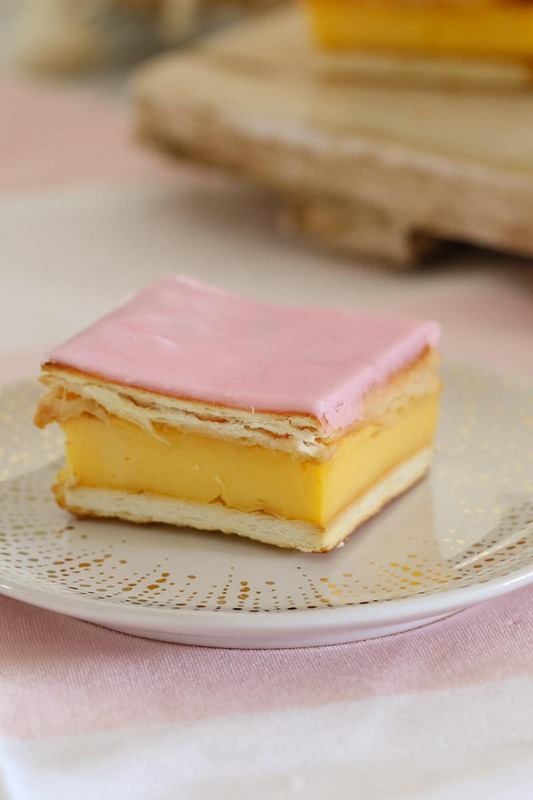 The easiest, most delicious vanilla custard slice going round. Kiss goodbye to the bakery-bought versions and say hello to homemade goodness. 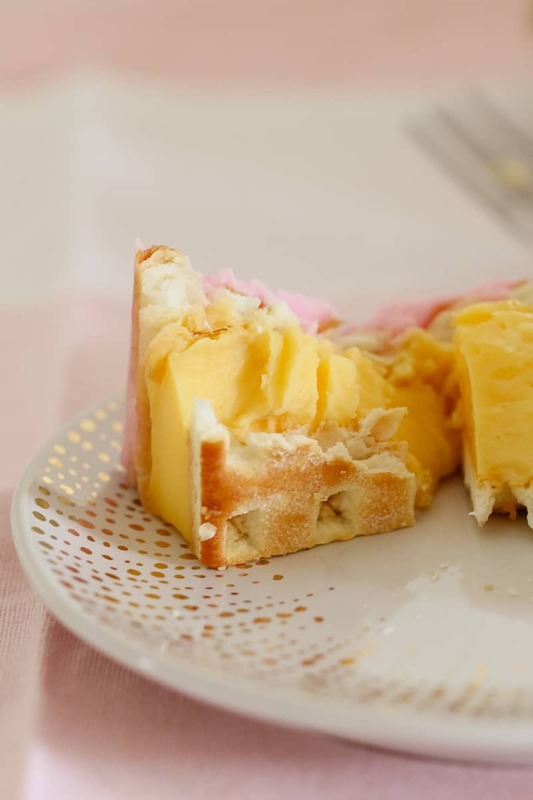 For more yummy slice recipes, check out my collection of traditional slices here. Lightly grease the base and sides of a standard-sized square cake tin. Place 9 of the lattice biscuits in a 3X3 grid on the base of the tin (they should fit almost perfectly). Set aside. Place the custard powder into a saucepan with 1/4 cup of the milk. Stir until all of the custard powder has dissolved. Add the remaining 2 1/4 cups of milk and the caster sugar. Whisking continuously, heat the custard over a medium heat for 5 minutes or until it has started to thicken. Once the custard starts to boil, continue whisking for a further 2 minutes or until very thick. Place a sheet of glad wrap over the custard to stop it forming a 'skin' and allow to cool for 20 minutes. Pour/spread the cooled custard over the biscuits and top with another 9 biscuits in the same 3x3 grid. To make the icing, sift the icing sugar into a bowl and add the food colouring. Add the water 1 tablespoon at a time and stir until you have a smooth thick paste (that can be spread). Spread the icing over the slice and place into the fridge for 3-4 hours (overnight is best). Cut the slice into 9 pieces using the shape of the biscuits to guide you. I used Arnotts Lattice biscuits in this recipe. They are a sweet square biscuit. 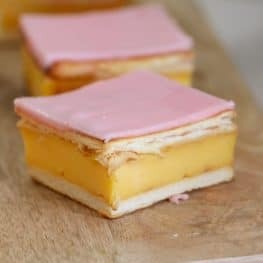 If you don't have access to these biscuits you can use Sao biscuits or even replace them with a sheet of cooked puff pastry on the top and the bottom of the slice. When making the icing, only add 1 tablespoon of water at a time and stir in between each addition. You want the icing to be thick but still able to be spread over the biscuits. This slice can be cut into pieces after 3-4 hours in the fridge, however, it is best left overnight as the biscuits with soften. i’ve seen these on other sites and they have white icing . 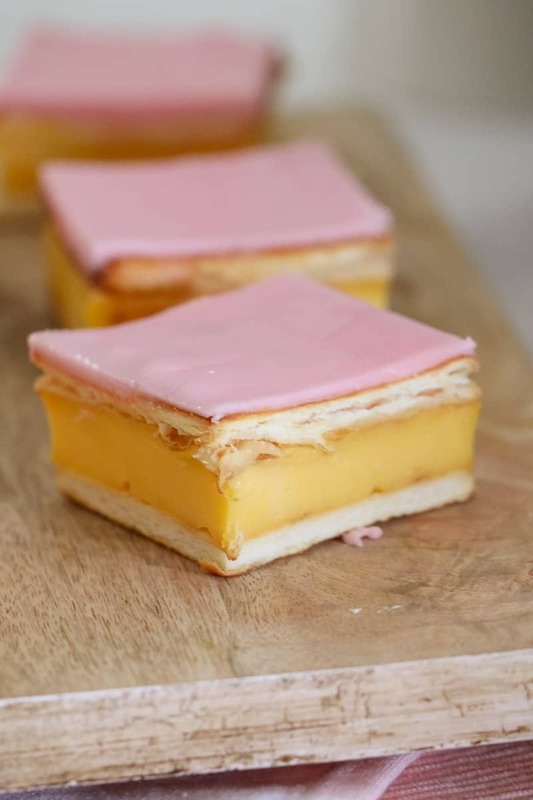 they also reckon that queenslanders call them custard squares or something. well, i was born in qld. 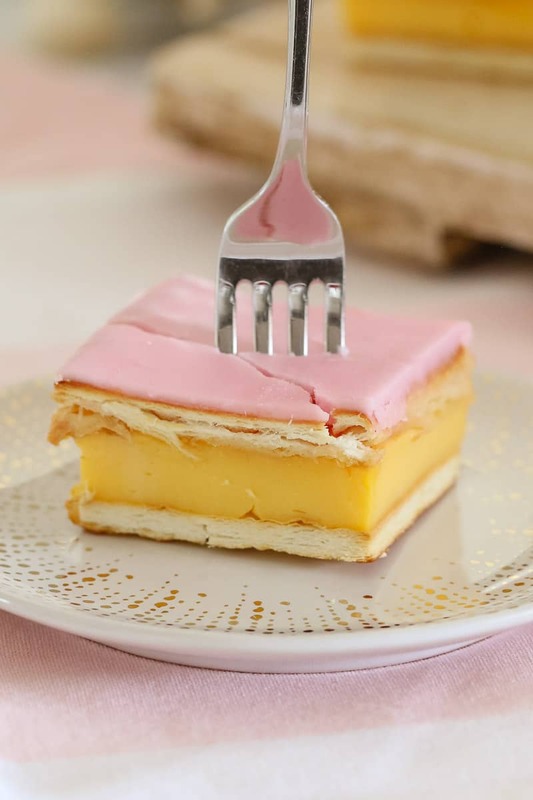 almost 60 years ago and have never called them anything but vanilla slices, and they always had pink icing. so thank you for getting it right. I have never seen them with pink icing! Yum! Hehehe pink is always lovely! One side of the lattice biscuits is glazed, does that do better facing down or up into the custard for the base layer?